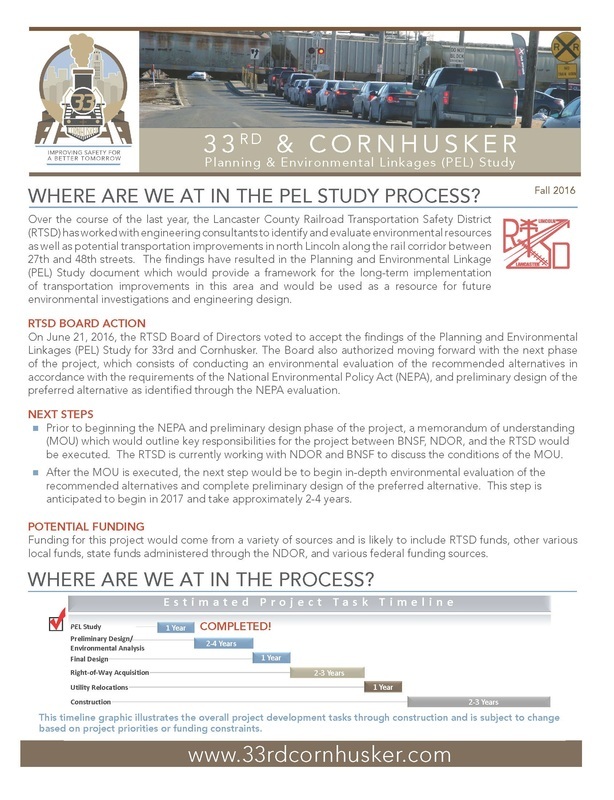 The 33rd and Cornhusker Planning and Environmental Linkages (PEL) Study addressed the dangerous at-grade railway crossings at North 33rd Street and Adams Street. The BNSF railway currently carries nearly 65 trains daily on the double-track mainline railroad through the subarea, resulting in at least 3.5 hours per day that each of the at-grade railroad crossings is blocked to vehicular traffic. Combined, these two crossings have one of the highest exposure ratings across Nebraska. 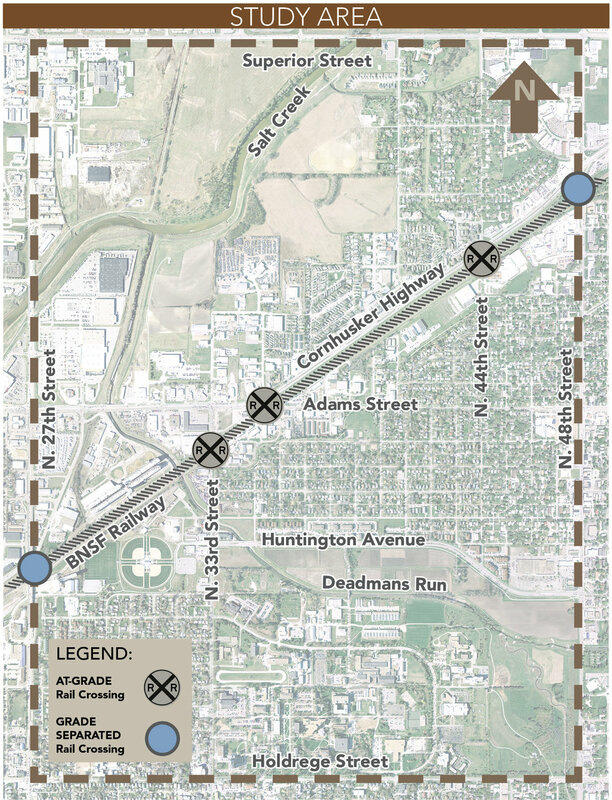 Through a systematic approach to address this major issue, the PEL Study generated preferred street configuration concepts that close the North 33rd Street and the Adams Street at-grade railway crossings. The study used impacts to the environment, traffic data and analysis, safety, mobility, connectivity, and public participation to analyze and evaluate alternatives. Two public meetings were held as part of the PEL Study process in November, 2015 and March, 2016 to share information about the PEL Study, the findings and gather public input. Ultimately, the PEL Study report was finalized and approved and the RTSD board in June, 2016. November 5, 2015: The first public meeting was held to share information about the Planning and Environmental Linkages (PEL) Study and gather public input. March 15, 2016: The second public meeting was held to share information about the transportation improvements that have been identified and evaluated, as well as information on the Deadman's Run Flood Risk Management Feasibility Study and gather public input. 4:30 - 6:30 pm at NET Building - 1800 N. 33rd Street, Lincoln, NE.